A post ago I posted about Healing Sounds. In Nia classes participants are encouraged to make noise or what we call sound. One reason to sound is to let the teacher of the class know you are breathing. This holds true for many exercise classes. Wanting students/participants to be breathing holds true for all teachers. There are a lot of reasons to sound, it does not have to be for healing or feeling better. But as I stated in that post, I just happened to come across that information and those sounds so I thought it would be fun to bring the list to class and use them as a focus. The first time we used the Healing Sounds in a Nia Class, I had written each sound down on a separate piece of paper and I taped them to the mirror. Before class I verbally reviewed each sound. Our focus was the Healing Sounds with an intent of bringing some healing. 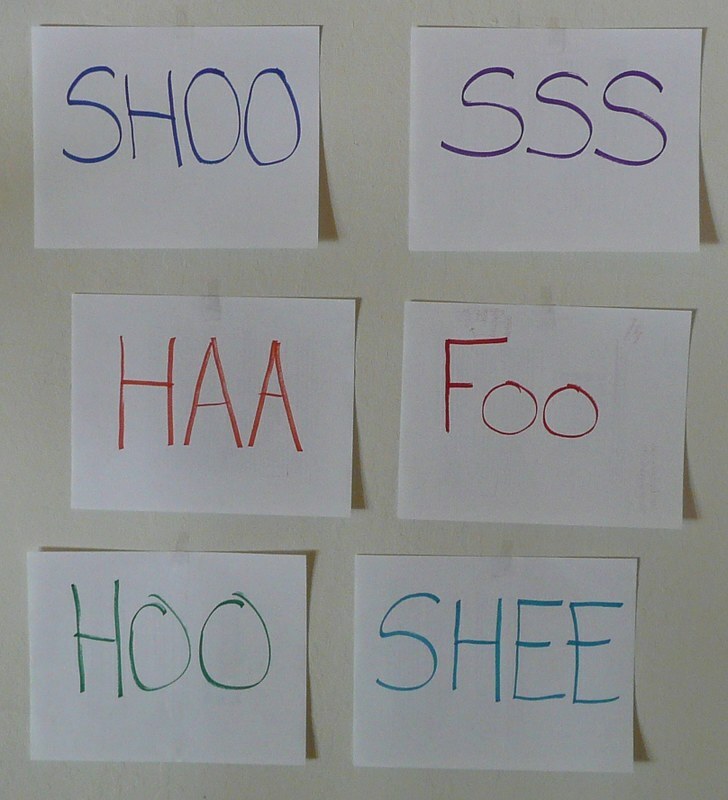 I invited the participants to make these noises during class. The general invitation was to make them any way; they could breath in and make the noise on one long exhale, they could make them quick and staccato, they could make the tone high or low. Whatever they wanted. Whatever they felt. As with most focuses I do bring them into play specifically at times so when we were punching or kicking I might have encouraged them to make loud and forceful sounds. I encouraged them at one point to try each sound. I also had them play with saying a sound at least six times as was mentioned in the information I had found. For my own practice I know that I used the sounds in a pattern and as with many things when one person does it others follow. So we did a lot of lead and follow with sound as each person thought of different ways to use the sounds. It was very fun. After the class I read to them what the sounds were related to and what they assisted with. It was very fascinating. Some commented that they had been drawn to a particular sound and they could see how that would be an area in which assistance would be appreciated. Some had fun doing a good job of using all the sounds. Some admitted that some sounds were more fun to make than others. The most recent time that I used the healing sounds I again taped up the papers with each sound written on it. But this time I read the information before class. So the participants were aware of what each sound was prior to dancing. The focus and intent were the same, but with the knowledge of what each sound assisted with some Nia students decided to focus on the specific sounds they felt would help them. Again we had the freedom of how to make the sound and when to make it. It is so exhilarating to hear my students weave sounding into the dance and to hear them make the sounds in their own way. This second time around it was rewarding to hear my students say, “Yay! I was just thinking about the healing sounds and hoping you would do them again soon.” So they enjoyed it the first time and were looking forward to it. I think I just decided today that with each routine I teach, with each round, I am going to do at least one class at each location (Willow Glen San Jose, Campbell, and Blossom Hill San Jose) where the focus is the healing sounds. Whether the belief is that they actually heal or not we all have a lot of fun with it. And they are sounds that my class actually make! You don’t have to be in a Nia class to experiment with the sounds. Have you used them? This entry was posted on April 24, 2012 at 7:00 pm	and is filed under Helpful Hints, Nia, Sounding. Tagged: FOO, HAA, Healing Sounds, HOO, Nia, Nia Blossom Hill, Nia Campbell, Nia class, Nia participants, Nia San Jose, Nia student, Nia Willow Glen, SHEE, SHOO, sounding, SSS. You can follow any responses to this entry through the RSS 2.0 feed. You can leave a response, or trackback from your own site.